If you want to take multiple screenshots quickly and easily, here’s a great solution. 1. Download IrfanView, a feature-filled but lightweight image viewer for Windows. 2. Run it and type ‘c’ (or go to Options -> Capture / Screenshot). 4. 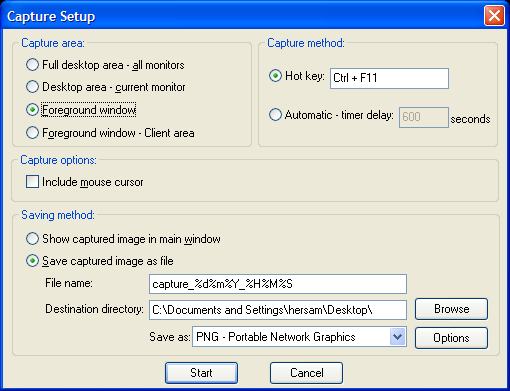 Press ‘Start’ and then go about your business, hitting Ctrl-F11 whenever you want a screenshot. The files will be saved in whatever directory you chose. The nice thing about this is you don’t have to name the screenshots or deal with any dialogs while you’re making the screenshots. Additionally, IrfanView has a batch/rename feature that you can use to rename all the screenshot files to something more useful after the fact.